What Is Diaphragmatic Breathing or Abdominal Breathing and How Can Breath Support Help Me Learn To Sing Better? For the singer to master diaphragmatic breathing or “abdominal breathing,” as well as intercostal breathing and back breathing, it is first vital to understand what the diaphragm looks like and how it functions. The diaphragm is a large muscle sheath that stretches across the bottom of the ribcage, nearly cutting the body in half, separating the lower organs from the heart and lungs. During normal breathing, the diaphragm naturally flexes and contracts drawing air in and out of the lungs. “Supporting the voice” and “singing from the diaphragm” means flexing the diaphragm more deeply than during normal breathing and, what is more important, maintaining the diaphragm in that flexed position to control the release of air and the air pressure that streams across the vocal cords for phonation. To sing better, a vocalist must learn to preserve a reservoir of air in the lungs that supports and holds up a small amount of air released across the vocal cords. Picture a balloon filled with air, and the sound you can make by squeezing the lip at the top. It is only a small amount of air being released that makes a sound. It is the large amount of air maintained in the balloon that gives the small amount of air its force and ability to make sound. A large amount of air supporting a small amount of air — that is the definition of breath support. Once the balloon loses too much air, the sound dwindles, the pitch falls, and wavers until, even with some air left in the balloon, there is no sound, because there is no air pressure supplying a force to vibrate the lip of the balloon. The same is true of the voice. In order to learn to sing better, the most important of singing tips you can hear is this — singing begins and ends with the breath. You must always think of the voice as a wind instrument. Like a flutist or a horn player, great singers strengthen the muscles of the lower core that control the diaphragm. There are many deep breathing exercises you can learn to strengthen the intercostal muscles, abdominal wall muscles and lower back muscles which will all enable you to keep your diaphragm in a flexed position. While practicing your vocal warm-up exercises, if the lower half of the rib cage is kept wide and the intercostal and lateral muscles are held in position, the resulting flattened diaphragm will support the breath. The abdominal wall muscles will expand as the ribs widen, and engage as the air is released to assist in this expansion. Allow yourself to have a “fat belly.” Do not push the belly out, but let it expand as you widen in your lower core, and once expanded, keep your abdomen comfortably round, and your lower ribcage comfortably wide. Imagine that the air is heavy, like water, and let it drop into your body, as if it is dropping into your lower core below the solar plexus, all the way around including your lower abdomen and your back. 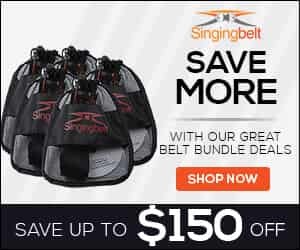 (I created the Singingbelt, so you can easily feel this expansion and quickly realize when you are contracting). Use a mirror and watch that the chest and shoulders do not lift and tighten. As you sing and maintain your support, watch and see if you can control your breath so that the exhale of air is almost imperceptible, though you clearly can see the inhale. If your chest is working like an accordion, you are not supporting the voice. The most common of breathing problems singers have is releasing the diaphragm from the first note, and thus giving the air away at the very top of the phrase — air they will need and lack by the end of a phrase. Learn to initiate phonation without a push of air. Try putting your finger right on your lips and singing the first five notes of a simple scale up and down on “oooh.” Do you feel wind blow against your finger? If so, you are giving your air away. Your goal should be warmth, but no wind. Proper singing technique also requires maintaining the breath at the end of a note or phrase. You do not want to release air as you finish a note with an exhalation. Instead, you want to stop the breath with the sound and inhale — this is known as a “catch breath.” Try putting your finger up to your lips again, and notice this time, if you feel wind at the end of the scale. Stop the exhale at the end of the phrase, by resisting the contraction of the diaphragm and staying wide in the lower core. Practice starting and stopping the breath without sound and notice how you do not need to use the back of your tongue or your lips. You can simply hold the breath, start and stop it. Pretend you are singing under water and you want to stay under as long as you can and you are supplied with a tank of air. Sing a note on “ah” and then stop the note, as if you’re under water and still need to hold your breath. Don’t chomp down on it. Just start and stop the note while conserving your air. Pretend to take a breath from the tank and repeat. Keep the release of air and the sound as even as you can. If you need to start the “ah” with a small and easy “h” to keep from pushing as you start, do so, and as you repeat the exercise, slowly remove the “h,” so you can begin the “ah” sound without a push. Relax and work with an amount of air that feels comfortable and natural. If you take in more air than you are prepared to control, your impulse will be to give it away. Try holding your breath between two or three phrases of your vocal warm-up exercises. Notice that if you do not breathe in or out in between phrases, you are less likely to give away air on the first note of the second phrase. The singer is holding the air in the body and balancing the notes on the breath, not pushing air out or bearing down. Singing can be thought of like surfing or skiing in this way. If I push too hard with the breath one way or another, I’ll throw myself off balance and off pitch. Try singing steady notes, while following a smooth even motion of your own hand with your eyes. Notice if there’s a difference in your singing, if you are watching a smooth, steady motion or nothing at all. During higher notes, longer phrases and belting, the singer will feel the air pressure down into the abdomen, a similar feeling to playing a trumpet. Make a fist, press your lips right up against it and blow, as if you were playing a trumpet. Notice the feeling of the air pressure pushing back down into the body. Blow the whole breath slowly and feel your abdominal muscles engage down into your pelvis. The feeling of the air pressure slightly pushing back is the only feeling of pressure you should feel as a singer. You should never feel any kind of pain or pushing, especially around the neck and throat, just pressure of the air on long phrases or higher notes down in the belly, and on big notes into your pelvic wall. 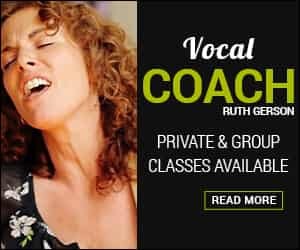 To improve your singing voice, you want to train the whole core for proper diaphragmatic breathing, meaning not only the techniques of abdominal breathing, but also intercostal breathing and back breathing which will all assist you in supporting your voice. Examine pictures of the diaphragm to get a deeper understanding of what is going on inside your body as you sing. Knowing what it looks like inside will help you do what works on the outside. It is the lungs in the chest that contain and release the breath, but it is the muscles of the lower core that keep the diaphragm flexed controlling the air pressure and the sound of your voice. So, you are not literally breathing into your belly or breathing into your back, however, it is the sensation that you are.